It’s gotten to be a pattern on the Left. When Black protest erupts into insurrection, as it did in Ferguson and Baltimore, most liberals and white radicals express empathy for the cathartic release of anger, but urge the oppressed that this is not the way. This is “not strategic,” says the leftist concern-troll. This is “what the police want.” Most of the time they manage to stop short of asking “why are they burning down their own neighborhood?” –if only to be mindful of clichés—but some can’t even help themselves there. In the aftermath, Amy Goodman (seemingly channeling Alex Jones) will spread conspiracy theories on how the government “orchestrated” the rioting.¹ The respectability politics of nonviolence will return. It’s hard to believe that anyone who has paid attention to Black Lives Matter takes these positions in good faith because, of course, the riots in Ferguson were objectively the best thing that happened to a movement that was already more than a year old. In August 2014, Trayvon Martin and George Zimmerman had been almost completely forgotten by white America except as grim punchlines, while national civil rights leaders were more concerned with Chicago’s gang killings than with the national wave of police terror. Yet by December, in the wake of recurring rioting in both Ferguson and the Bay Area, the Ferguson PD was under investigation by Amnesty International, the Justice Department and the United Nations ( and #BlackLivesMatter had been named Word of the Year by the American Dialect Society ). This month the pushback comes with Jonathan Chait’s promotion of a scholarly paper on the effects of rioting on Black liberation in the 1960s. Chait’s argument can be critiqued on just about every level: the paper has a distorted idea of what liberation is (apparently, it means electing Democrats), an undefined idea of what rioting is, and on top of that the paper isn’t even accredited scholarship, in the sense that it hasn’t been peer-reviewed by anyone (except of course by Jonathan Chait). Chait and Wasow’s position is a restatement of the timeworn “backlash thesis.” Over the years, this thesis has been largely discredited by various studies (studies which, unlike Wasow’s, were peer-reviewed). The weakness with the thesis is not that there was no serious white backlash to the anti-racist movement, but that the backlash started as soon as the civil rights struggle began in the mid-1950s, not suddenly after the mid-60s Northern rebellions. Take for instance Michael Klarman’s book From Jim Crow to Civil Rights (which one reviewer calls “the first great and indispensable work of American constitutional history in the twenty-first century”). Klarman demonstrates that Brown vs. Board of Education didn’t inspire an unambiguously effective civil rights movement, it inspired an uncertain experiment in passive resistance which in turn provoked the segregationist “massive resistance” movement. And just as Brown didn’t lead to widespread desegregated schools, the Supreme Court decision that emerged from the Montgomery bus boycott didn’t lead to widespread desegregated buses—most Southern municipalities simply ignored it, and launched highly effective repression against Black activism and liberalism generally. Montgomery itself enacted new segregation laws after the boycott victory, and terrorized both moderate and radical political figures (Rosa Parks fled the city after the campaign, both because she was blacklisted from work and because of credible death threats). On the rare instances where the federal government stood up for school desegregation, like in Little Rock in 1958, the conservatives were strong enough to wait out the withdrawal of troops, or else simply shut down the schools rather than comply. A new hope seemed to emerge in the early 1960s with the lunch counter sit-ins, the Freedom Rides, and the Mississippi voter registration drives. But the sit-in movement only led to the desegregation of Woolworth’s luncheonettes—most Southern eateries remained Jim Crow. The Freedom Rides were actually unpopular with the American public, most of whom thought Blacks were moving too fast. And the Freedom Rides led to yet another federal decision that was seldom honored in the South. The Mississippi movement provoked a wave of lynchings that the Kennedy administration did nothing to prevent. Klarman noted that the early civil rights movement had a “backlash-counterbacklash” dynamic. Birmingham wasn’t an isolated episode; Black insurrection flared across the country for the rest of 1963 and into 1964. Sometimes it was milder than Birmingham and sometimes it was more explosive. SNCC leader Gloria Richardson recalls that in her campaign in Cambridge, Maryland, activists exchanged gunfire with National Guardsmen just a few months prior to the passage of the Civil Rights Act. This is not a sectional issue. Difficulties over segregation and discrimination exist in every city, in every State of the Union, producing in many cities a rising tide of discontent that threatens the public safety…The fires of frustration and discord are burning in every city, North and South, where legal remedies are not at hand. Redress is sought in the streets, in demonstrations, parades, and protests which create tensions and threaten violence and threaten lives. Kennedy’s speech is the first time the federal government even acknowledged it had a major racial problem in the North. The post-Birmingham uprisings were indeed the root of the nationwide white backlash, but they were also the beginning of a truly nationwide civil rights movement. And they proved to be the first real federal breakthrough in either the North or South. We can see in this chart that there was little violent activity in the early sixties movement—but we can also see that there was very little nonviolent activity in the movement either. The marked decline of nonviolent protest shown in 1962 confirms Malcolm X’s characterization in his “Message to the Grassroots” speech that the movement seemed to be on its last legs that year. 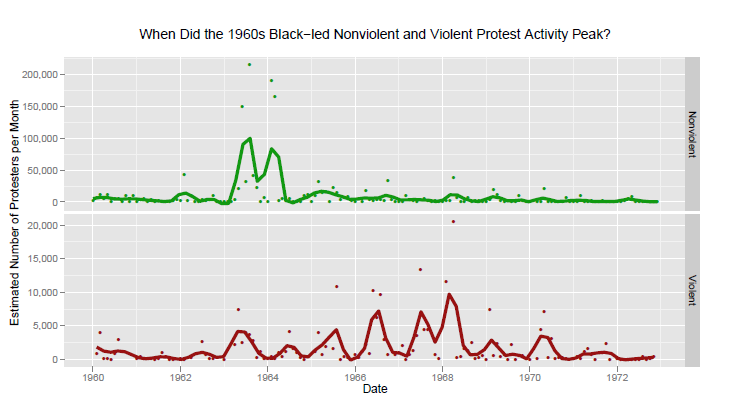 Then, in 1963, we see violent and nonviolent activity spike in unison—if anything violent protest leads the trend. The riotous tendency in that year helped to stimulate nonviolent protest (including preparations for the March on Washington for Jobs and Freedom). And as we’ve already seen, it directly inspired Kennedy’s Civil Rights Address and proposal of his civil rights bill. The chart also shows a smaller but still significant curve towards violence in 1964. The peak of this curve appears to be June 1964—the month the Civil Rights Act was finally passed. And once again, riots and peaceful protests rose and fell together in similar timeframes. Also note that the Watts rebellion doesn’t spring out of nowhere in August 1965; it’s part of a general increase in militancy that begins in the first half of the year, which means that the Voting Rights Act of 1965 is also inseparable from the threat of riots (Note too that the overall rates of violent protest in 1965 and 1963 are nearly the same). Wasow doesn’t mention the Birmingham riot, or the Cambridge riot, or the “fires of frustration and discord…burning in every city, North and South,” in 1963. They don’t help his case. But they do prove the case of the anarchist writer Peter Gelderloos, who’s noted for years that the civil rights movement at its strongest was a model of diversity of tactics.